Here is a quick Afro Urban Promo Mini-Mix for the month of September 2018. Included in this mix are tracks from Naiboi (Kenya), Seyi Shay (Nigeria), WCB Wasafi (Tanzania), Mr. Eazi (Ghana), WSTRN (UK), Maleek Berry (Nigeria) & Skepta (UK). 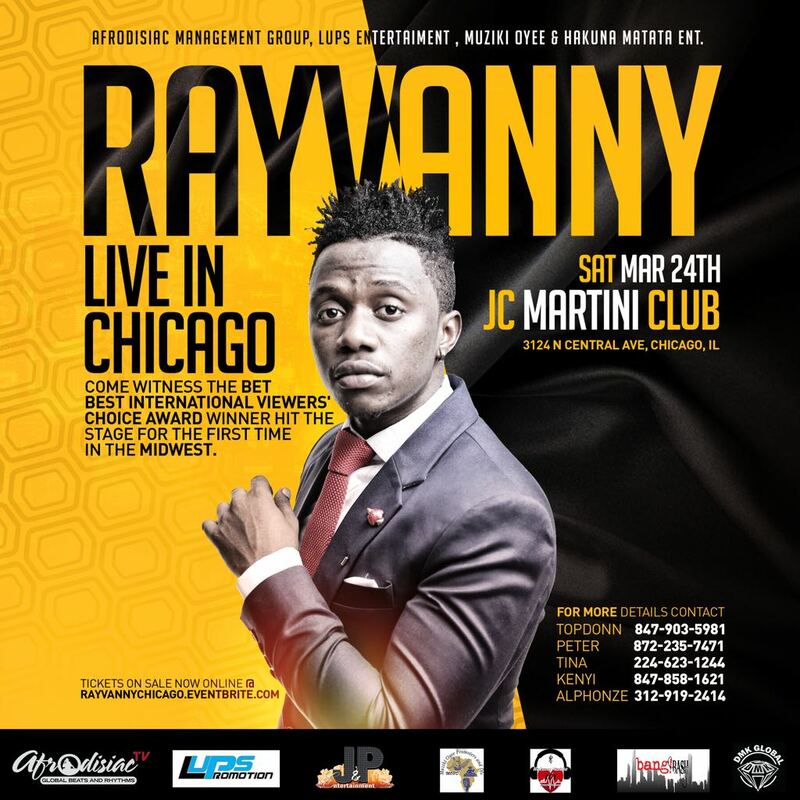 Tanzanian recording artist Rayvanny will be performing live in Chicago on Saturday, March 24th @ The JC Martini Club, 3124 N Central Ave, Chicago, IL. Rayvanny, who is currently signed on the WCB Wasafi Records label under Diamond Platnumz leadership, is best known by his hit songs “Kwetu”, “Unaibiwa” & Zezeta. He is also currently riding the wave of his current single Makulusa, which has spawned off the “Makulusa Dance Challenge” across Africa and the world. Make sure to catch him live in Chicago on Saturday March 24th. Early Bird Tickets on sale now for only $25. 2017 African Festival Of The Arts @ Washington Park. The 2017 African Festival Of The Arts will take place from Friday Sept 1st through Monday September 4th. This years main acts include Wizkid, Wayne Wonder & Wyclef Jean. They will be joined on stage by a variety of local based Chicago artists including Aime, P. Jericho, Obi Soulstar, Ugochi, Mo Beat & more. Also on deck will be the AfroZons crew from Chicago’s Power 92.3FM including host Sheila O. as well as Afrodisiac TV’s own DJ TopDonn. Afrodisiac Management Group are proud to announce the forthcoming release of the collaborative single by Eddy Kenzo & Werrason titled “Malembe”. “Malembe” is derived from the Congolese language Lingala and means “Love”. Malembe is an uptempo track that fuses the Afro Pop style of Ugandan Eddy Kenzo with the live instrument driven Rhumba style of Congolose legend Werrason. The collaboration was facilitated by Chicago based Afrodisiac Management Group is available on all digital platforms including iTunes & Amazon. You can listen to a snippet of the song below. 3 weeks after the release of the track “Jubilation” by Eddy Kenzo, it has now risen to the top of the East African charts on the Trace Mziki channel. The self professed “King of happy music” has another bonafide on his hands. Fally Ipupa is ready to release a new single called “Eloko”. This past week he was in Paris shooting the video to the track with veteran music video director Chris Kay. The single is due to be released on April 7th. Wizkid has revealed the reason why Drake was absent in his new video for ‘Come Closer’. 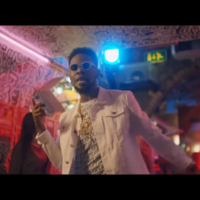 The Nigerian singer has released the visual for his collaboration with the US rapper – ‘Come Closer’. The video was directed by Dapo ‘DAPS’ Fabenle, and Drake was conspicuously absent. And as fans continue to wonder why, and inquire on social media, Wizkid has responded. In 2016, the singer was absent during Drake’s video shoot for ‘One Dance’, and failed to make the final cut. And according to some section of fans, it was payback time. Wizkid has responded. Replying a fan, he said: “Had a family emergency during ‘One Dance’ video shoot, and Drake was on tour when we did ‘Come Closer’. No bad blood, one love still” He tweeted. South African DJ & Music Producer Prince Kaybee is at it again. He’s partnered and collaborated with the delectable Lady Zamar on a smoking new join titled Charlotte. This latest effort is just magical and heavenly. As Prince Kaybee unleashes his craft on the turntables, the Love Is Blind lady comes through with her celestial vocals on a deep, soulful and love-inspired jam. This is the definition of beauty right there and it streams right into the depths of the heart and soul. Superstar duo – P-Square gets you in the valentine mood with this amazing video for their latest single “Away”.